These street rod headers are like tight-fit headers, but longer. Extra mid-to-upper RPM power. 1-5/8" primary tubes and 2-1/2" collectors. With reducers, gaskets and bolts. 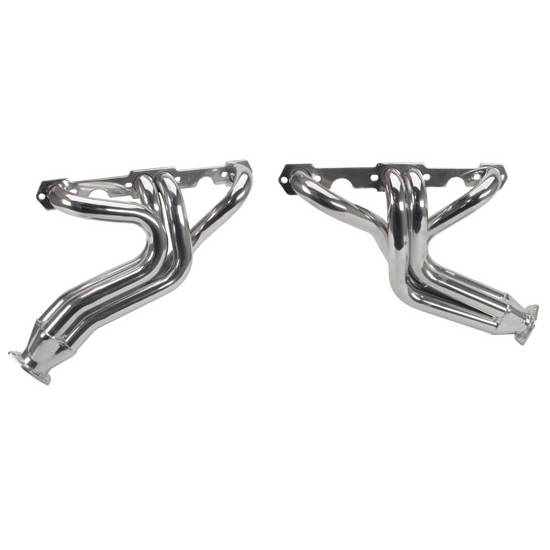 These ceramic coated headers provide superior performance and durability. Check motor mount's position before ordering. Not legal for sale or use in California on pollution controlled vehicles. Will not fit angle-plug heads due to spark plug clearance problems. Armor Hot Coating (AHC) is a heat resistant, ceramic coating applied to the outside of the header. This coating will reflect heat, which helps retain more heat within the header tube while simultaneously speeding up the exhaust flow. Not only will this coating help you make more horsepower, it also keeps your headers rust-free, looking great, and lasting longer (when properly maintained). If you are looking for a show-quality finish for your headers, this is it! Our AHC will withstand exhaust temperatures of up to 1300Ëš F.